Although George Cole would become the first of four generations of Cole family painters, his own beginning was very modest. 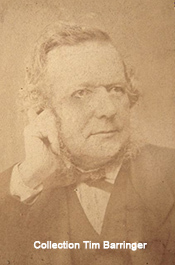 Even his birthplace remains uncertain, being either London or Portsmouth, although his birth date of January 15, 1810 is confirmed from later census records in 1871 and 1881. He was the second child of James and Elizabeth Cole, whose daughter, Lucy Parker Cole, had been born in 1800. The family was based in Portsmouth, Hampshire on the south coast of England. There is little information about Cole’s childhood except for repeated assertions that he had no formal education, and that his father was essentially a wastrel who spent money as quickly as he made it. When his mother died on October 12, 1819, the children seem to have been largely on their own; Cole’s sister Lucy would have been nineteen at the time, while he was only nine. Cole’s education as an artist is equally obscure. There are two explanations of the subject. The Cole family tradition, which was recounted by the painter’s grandson, Rex Vicat Cole, in 1938, says that Cole was apprenticed to a ship’s painter serving the Royal Fleet at Portsmouth. [i] This account has the merit of coinciding with the historical situation in the 1820s following the Napoleonic Wars; at that time, the Royal Navy ships would have required extensive repair and restoration, and the Portsmouth Naval Yard would have been a logical place to undertake those efforts. As a ship’s painter, the young Cole would have been involved in decorative painting of the ship’s quarters, probably including figural and landscape imagery as well as gilding techniques for special features. The alternative account of Cole’s artistic training is somewhat more fanciful, although it seems to have been repeated often. According to this tale, which was published in the Dictionary of National Biography in 1887 (four years after the painter’s death), Cole’s “...early studies were made in a travelling (sic) menagerie belonging to Wombwell, who, on application, allowed the youth to work from living animals, and afterwards commissioned him to execute a large canvas of twenty feet square illustrating a tiger hunt in the jungle with elephants. This composition was exhibited first at Weyhill Fair, but on the following day a terrific storm almost destroyed it; the pieces were, however, collected, sent to London, and carefully put together, which enabled its proprietor to show it again at the ‘Great Barthelemy Fair.’ These show-cloths were far beyond the ordinary in artistic quality, and were very masterly in execution. Cole now felt that he was deceiving the public by representing animals of unnatural sizes, and decided to leave the showman. He went to Holland to study animal painting with the best Dutch masters.” [ii] George Wombwell (1777-1850) was the well-known owner of a traveling menagerie of exotic animals; his show was perennially popular with the public, and he was even invited to exhibit his animals at the court of Queen Victoria on five separate occasions. However, any relationship he may have had with the young George Cole remains conjecture, as does the source for this story in the Dictionary of National Biography. The next decade was one of growth and exploration for Cole. His work consisted primarily of portraits and animal paintings although he also experimented in genre paintings, landscapes and marine paintings during these years, most likely in an effort to discover what suited him best. Under other circumstances, a young artist would have the luxury of developing his artistic voice as part of his formal education. For Cole, it was his independent study of Dutch and Flemish masters that facilitated his aesthetic evolution, although when and how he was able to do this is unclear. If he went “to Holland to study animal painting with the best Dutch masters” as stated in the Dictionary of National Biography, then it is entirely possible that he left England sometime during the late 1820s before his marriage. However, Cole almost certainly studied seventeenth-century Dutch paintings in the collections of some of his Portsmouth patrons during the 1830s. Unlike the more typical wealthy industrialists in British industrial cities like Birmingham or Manchester, Portsmouth’s art collectors tended to be drawn from the armed forces gentry, successful international traders associated with the Royal Navy, and from a handful of minor aristocrats. This atypical social hierarchy had been established very early in the history of Portsmouth, which has been a critically important naval yard since 1194 when Richard the Lionhearted used it as a base to reclaim the English throne after his return from captivity in Austria. In addition, the city had an unusually high population density created by the its location on an island at the confluence of the Solent Strait and the English Channel; this geographic isolation, together with the residents’ purchasing power, meant that the market for luxury goods was particularly strong here. Combined with the geographical proximity to Holland and Flanders, it is not surprising that the market for paintings from these regions would find a steady audience among Portsmouth’s genteel society. One of the key figures for Cole was undoubtedly Sir Robert Peel, whose “...pictures are selected mainly from the Dutch and Flemish schools. Although consisting for the most part of small paintings, the collection is valuable; comprising master- pieces by Rubens, Ostade, Miens, Ruysdael, Vouwermanns, Gerard Dow, and other notables of the same schools.” [iv] Cole would have seen this collection at Peel’s home when he was working on a painting of the prime minister’s favorite dog, Cato. The painter’s work as an animal painter and portraitist served him well during the 1830s and 1840s, allowing him to establish a reputation as an artist and to support his ever-growing family. His eldest son, George Vicat was born in 1833 followed by Edwin in 1838. Cole’s earliest known exhibition in London dates from 1838 when The Farm Yard was exhibited at the Society of British Artists at the Suffolk Street Galleries. The fact that the painting was shown at such a well respected exhibition seems to indicate that Cole’s previous work had achieved some earlier success among the art community of the capital. This London debut also seems to have motivated the twenty-eight-year-old artist to seek out formal art lessons from a Scottish landscape painter, John Wilson (1774-1855), sometime around 1839-40. Under Wilson’s influence, Cole thoroughly explored landscape painting during the 1840s, traveling throughout England and Wales in search of diverse topographical motifs. As he gained confidence--and sales of the landscape paintings--Cole purchased a new studio on Pembroke Street in 1846. Two years later, in 1848, he moved his family (now with four children) to Montague Lodge, a larger and more prestigious home in Buckland, just outside of Portsmouth. 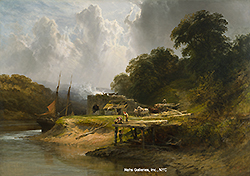 In 1849, his painting entitled A Gravel Pit was accepted at the Royal Academy’s annual exhibition, thereby establishing him on the national artistic stage for the first time. Throughout the 1840s, he also regularly showed his work at the Society of British Artists’ annual display at the Suffolk Street Galleries. In 1850, he was elected a member of the Society of British Artists, an organization that he would be closely involved with for the rest of his career. With a successful career established, and a more ample income steadily available, Cole began to travel further afield for inspiration. One particularly significant trip was a visit to the Moselle region of Belgium, France and Germany in the spring of 1851. His eldest son, George Vicat who was then eighteen, accompanied him on the sketching expedition, and both of them subsequently produced significant landscapes of the area. The elder Cole exhibited a large landscape, A Yoke of Draught Oxen on the Moselle, at the Royal Academy in 1853 and, in 1854, he showed no less than seven major paintings based on the Moselle region at the Society of British Artists exhibition. With his career increasingly focused on London galleries and exhibitions, Cole decided to leave Portsmouth and move to the capital city in 1852. That same year, his son George Vicat made his debut at the Society of British Artists; the family’s move to London provided a convenient base for the development of his fledgling career as well, and allowed him to continue working closely with his father during these years. Initially, the family settled at 2 Lewis Place in the Fulham neighborhood of London where they acclimated themselves to life in the Victorian-era bustle of the world’s foremost industrial city. Shortly after arriving there, Eliza Cole gave birth to a fifth child, Lucy Elizabeth, in 1853. Familial relationships changed dramatically in 1855 when George Vicat quarreled with his father, and moved out of the family home. The cause of the estrangement remains unknown although it has been suggested that there was a disagreement about George Vicat’s involvement with Mary Ann Chignell, the woman who would become his wife the following year on November 7, 1856. During this personally troubling period, Cole moved his family once again, this time to the neighborhood of Kensington, where there was a thriving contemporary arts community, including several art schools and the newly opened South Kensington Museum, known today as the Victoria and Albert Museum. The Cole’s home at No. 1 Kensington Crescent not only provided sufficient space for the extended family, but also included several outbuildings that were converted into studio space. Throughout the 1860s, Cole traveled widely in Britain, expanding his regular itinerary to include trips to Scotland as well as North Wales and Yorkshire. As always, his sketchbooks were filled with drawings of both landscape details and panoramic vistas; however, the scale of his paintings began to increase to five- and six-foot canvases. In part, this was a reflection of Cole’s popularity with both art critics and the public, which purchased his work almost as soon as it was completed. His paintings were shown at several of the more prestigious London galleries, including Arthur Tooth and Sons, Thomas McLean’s Gallery and Henry Wallis’s French Gallery (later Wallis and Sons). Equally important, Cole accepted the position of vice-president at the Society of British Artists in 1867, a role that solidified his reputation as one of the leading landscape painters in Britain. As a largely self-taught artist, Cole never abandoned his desire to explore and evolve as a painter. When he purchased Coombe Lodge, a small country house in Hampshire, in the mid-1860s, it offered him a more secluded studio where he could work without the distraction of his family. In addition, his art dealers typically visited him at Coombe Lodge where they could see the large-scale canvasses in progress and discuss potential exhibitions. A brief overview of Cole’s progression as a painter reveals a gradual transition from the lucid marine images, such as Entrance to Portsmouth Harbor with British Man of War in 1838 through a period in the 1850s when he was influenced by seventeenth century Dutch compositions, seen in a work such as Landscape Near Pullborough, Sussex, 1856. By the 1860s and 1870s, he had moved into a naturalist mode, indicating an awareness of the Pre-Raphaelite Brotherhood in England, but perhaps also of the Realist painters in France whose insistence on the dignity of rural life was a recurring theme. Cole’s 1876 painting A Cornfield portrays this sentiment unapologetically as he depicts farm workers harvesting wheat on a luminous hillside. One other symbol of Cole’s rise to prominence as an artist was his commitment to creating a personal library. He began this process in the 1830s shortly after his marriage and continued it until his death. For many artists, this would be a routine activity, but for George Cole, the presence of a library signaled both his educational accomplishments and his cultural sophistication, important attributes for a man who began life in very undistinguished circumstances. In recognition of the significance of this library, Cole’s descendants maintained it intact until it was destroyed by shrapnel during World War II. [i] Interview with Rex Vicat Cole, grandson of George Cole, in The Hampshire Telegraph and Post, February 11, 1938. 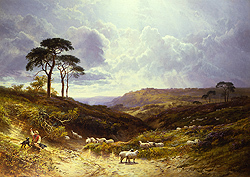 Cited in T. J. Barringer, The Cole Family: Painters of the English Landscape, 1838-1975, ex. cat. Portsmouth City Museum and Art Gallery, April 1-June 26, 1988, (Portsmouth, UK: Portsmouth City Museums, 1988). [ii] Leslie Stephen, editor, Dictionary of National Biography, Vol. XI, (London: Smith, Elder, & Co., 1887) 266. [iii] T. J. Barringer suggests that Eliza’s family may have helped the young couple financially. See Barringer, The Cole Family : Painters of the English Landscape, 1838-1975, (Portsmouth, UK: Portsmouth City Museums, 1988) 29. [v] T. J. Barringer, The Cole Family : Painters of the English Landscape, 1838-1975, (Portsmouth, UK: Portsmouth City Museums, 1988) 61.